How to check that the AO Smith water heater with the power venting system operates properly? One of the ways to check is your AO Smith gas water heater with the power vent venting properly is to test the air pressure switch for proper work. 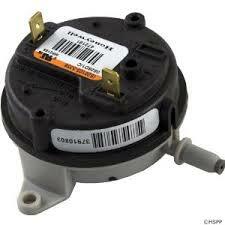 What is the air pressure switch? The air pressure switch is the element used on all power vent models and it checks that there is proper venting/removal of the products of combustion. It verifies that blower is running properly, which is not a case when the vent/exhaust pipes are blocked or very long. The switch activates in response to the pressure (ex. pressure change due to blockage), so it opens or closes the circuit sending the impulse to the circuit board for further action. The circuit must be closed at all time during the heating cycle. Open contacts mean that there is no flow of electricity, so the unit won’t run. The air pressure switch has a flexible diaphragm that divides the body into two air chambers (one is vented to the atmosphere) with its ports so when the diaphragm moves, it activates the switch contacts. In order to test the air pressure switch, you have to use the multimeter with ohm units and digital manometer that can read the positive and negative pressure. According to AO Smith manufacturer, there are three steps that need to be performed. The first step in testing the proper operation of the air pressure switch is to check if the switch contacts are opened or closed. The test should be done when the pressure is not applied, the power is OFF and when the switch is disconnected. Put the multimeter probes on wiring terminals and if there is continuity during the test, the contacts are closed and the switch must be replaced. Now you should perform the test when the unit is ON, the electric blower is running and the air pressure is applied to the switch. Disconnect the wires to the switch and perform the test while a blower is running. If everything is OK, the switch must close and remain closed during the heating operation. The third procedure should be performed if the continuity test indicates that the switch contacts are opened while should be closed, or didn't close during the test (see the previous test). During the last procedure, you must know at which pressure the switch opens (it can be positive or negative). This information is found on the switch label, or if you can’t find it, contact AO Smith tech. department. Disconnect the tube that is attached on the switch and connect there the digital manometer; turn the power ON and wait for some time after the blower kicks in and reaches the full speed; record the pressure reading. If the reading of the air pressure is the same as the activation rate or over, the contacts will close. In a case when contacts didn't close with the air pressure lower than the activation rate, the switch should not be replaced; while the piping and sensing tube must be checked for damages, obstructions or debris. The switch is defective only if contacts are opening during the blower operation. If the pressure reading reaches the activation pressure or is higher, but the switch contacts did not close, the switch is defective and must be replaced. Do not replace it if the closed switch contacts got open during the operation, first check the pipe length and look for possible obstructions. Keep in mind that surrounding air can also contribute to the switch activation. Find detailed instructions in this pdf.